Anker – best known for its affordable smartphone accessories – has recently branched out into making projectors under the Nebula brand. 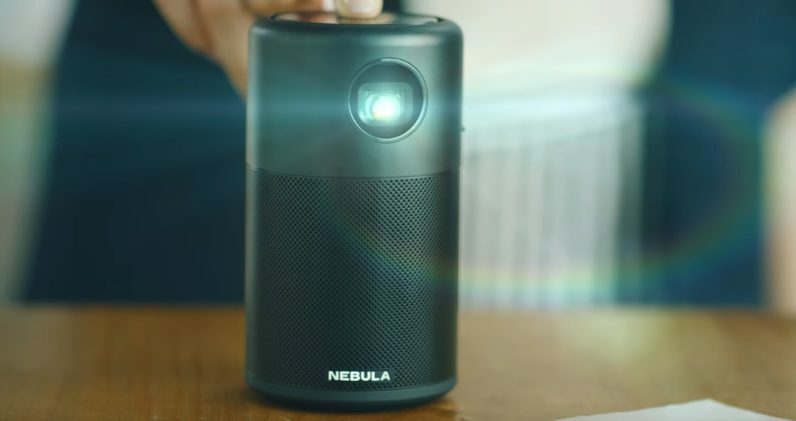 Now the company is gearing up to launch its smallest model yet in the Nebula Capsule, which fits an Android 7.0 projector in a device the size of a soda can. The device can project up to a 100-inch image at 480p, so while it’s definitely not ideal for high quality video, it can make for an immersive experience if you don’t mind the image being a little fuzzy or are watching an old movie now available at high resolutions. At 100 lumens, it’s not going to work in daylight, but it should suffice for watching in a dark room. The device features a 360-degree speaker, and you can actually just use it for Bluetooth audio when you don’t care about the projection bit. It’s rated at 2.5 hours of battery life for video, or 40 hours for audio only. It features Qualcomm Quick Charge so it can reach 70 percent battery in an hour-long charge. I’ve been testing one of Anker’s larger models, the Nebula Mars. If the Capsule is anything like it, it will be running a customized version of Android without the Play Store, opting for a proprietary app store instead. That said, the upgrade to Android 7.0 is an important one that hopefully means it will support sideloading many new apps not supported by the ancient version of Android (4.4) on the Mars. For its part, Anker says the Capsule will support Netflix, Hulu, YouTube, HBO, Amazon Prime Video, and Spotify. It will also be compatible with AirPlay and Miracast, although Google Cast is unfortunately not built in. At least it comes with an HDMI and USB port so you can plug in a Chromecast.